Most lilies need full sun to produce their large, perfect blooms. Many can grow in part shade. Growing easily from USDA Plant Hardiness Zones 2 to 9, there is a lily for almost every American garden. There are several shade-tolerant lilies that local gardeners call "tiger lily" in the United States. Their similarities explain why they share the same name. 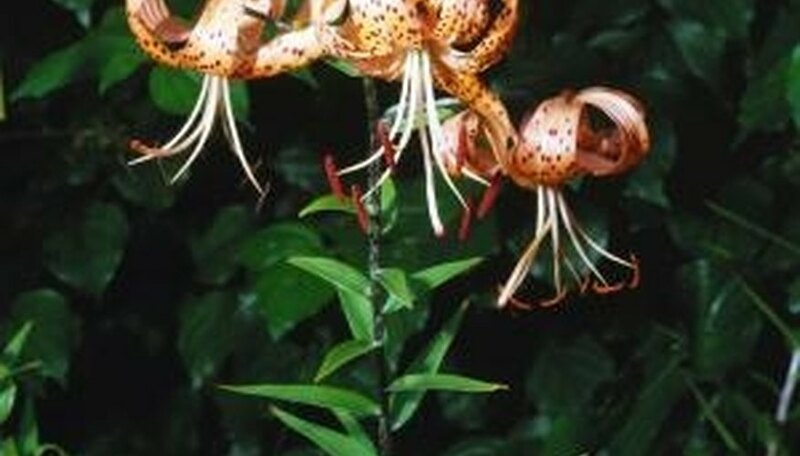 The Asian native, Lilium tigrinum, now known as L. lancifolium, provides the model for tiger lilies: tall stalks with nodding groups of dark-spotted orange blooms whose tepals curve back in a type of flower classified as "recurved." Tiger lily blooms are called Turk's cap; they form a little turban shape and open facing downward. L. lancifolium propagates by bulb division and little black bulbils that grow in the axes of its lance-shaped leaves. Eastern tiger lilies escaped from gardens, naturalizing along roadsides. They prefer full sun to part shade and bloom from mid to late summer. L. tigrinum is an ancestor of hardy Asiatic hybrids that bloom early in the summer. Several species lilies native to the West Coast are called tiger lily -- among other names. L. pardalinum, or tiger lily, a California native sometimes called leopard or panther lily, has tiger color and flower form on a plant that can tower to 6 feet. It propagates by bulb division and does not produce bulbils. It prefers partial shade. L. columbianum, wild tiger lily, is also called Columbia lily for its habitat along the Columbia River basin and is one of the shortest tigers, growing to about 3 feet. Like L. pardalinum, it has orange Turk's cap flowers. A third tiger lily, L. parvum, called the Sierra tiger lily or the alpine or fairy lily, has small, bell-shaped flowers that are orange and open outward. All West Coast tigers bloom from mid- to late summer and sport maroon to dark purple spots. Any tiger lily's ability to adapt results in part from its ability to thrive in partial shade. The tiger-leopard lily grows along stream banks lined with conifers where shade is dense. Eastern tiger lilies may not flower because they prefer full sun but West Coast tigers may flower, especially the Sierra tiger Lily, which grows near water or bogs under willows and alders. Wild tiger lily grows in dry subalpine in thickets or forests among the redwoods. All tigers but the wild, or Columbia tiger lily, grow from 3 to 6 feet tall. They will grow in full shade but sunlight is the fuel that makes them grow tall and flower. L. tigrinum may not flower -- or lean toward light in full shade. Western tigers, on the other hand, are familiar with varying degrees of shade and might flower for a few years. Full shade would, result in smaller, shorter-lived plants in all tiger lilies. No plant can flower in the dark; even tiger lilies perform better living on the edge of, rather than in, full shade.